Includes One 7" x 6" gray microfiber lens cloth. One 5 ml pump spray lens cleaner. 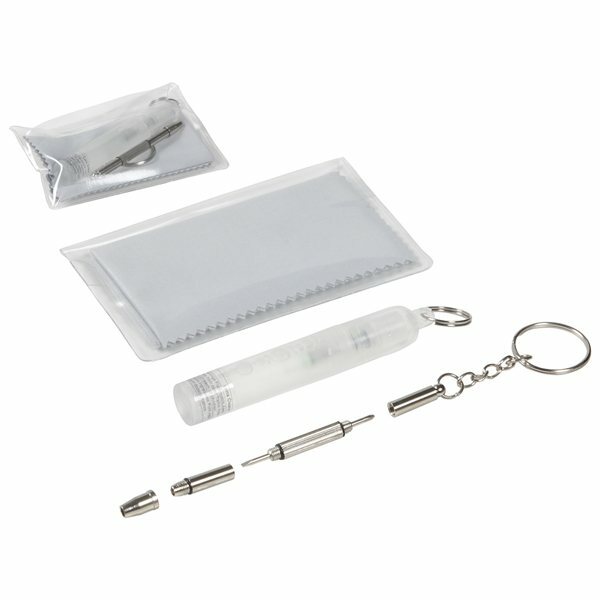 Slim keychain screwdriver with changeable flathead or phillips bits. The Eye Glass Care Kit #708378 is exactly what we wanted. Thank you very much. We would order from you again. the active lifestyle thrust of our company motivates us to look for promotional items that embody this advocacy. the logo and design was done exactly to our specifications. Very nice product and reasonably priced. I love this key lite! Will definitely this order again. It was quite solid and didn't lost form easily. This is definitely a good purchase!